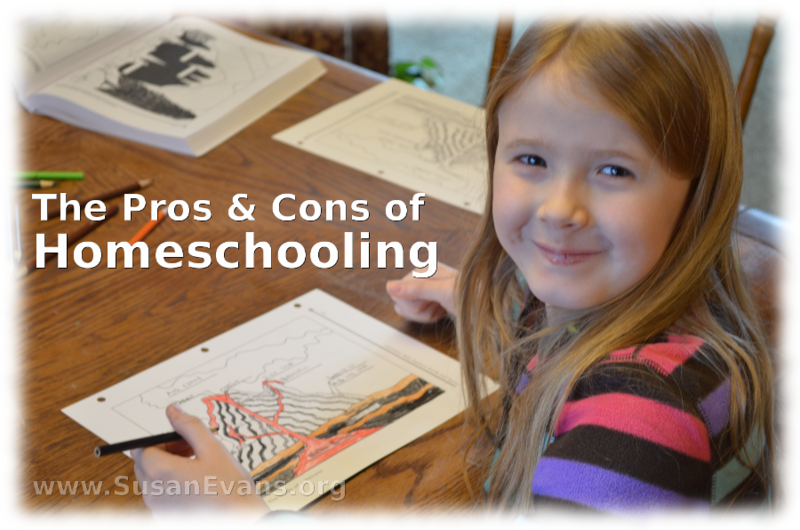 What are the pros and cons of homeschooling? Today you will have an opportunity to watch a video panel where homeschooling parents bluntly tell you the truth about the pros and cons of homeschooling. You might be surprised by some of my responses, which are not the typical “right answers.” I am just speaking from my heart. I will write down the main points that I mentioned in the video, but you will want to watch the video to hear what the other panelists said. Who should homeschool? What are good reasons to make that choice? You should homeschool if you want control over what your children learn, and if you want to mold their character instead of having their character molded by their peers. I want my children to know and love God, and I want a relationship with them. If we share the best part of the day together (rather than the dregs of the day), we are more likely to truly know each other. Who should not homeschool and why? If God is leading you not to homeschool, you need to obey God. My sister sends her kids to a Christian school, after praying intensely about it. She knew it was the right thing for her children. My best friend sends her kids to public school. The neighborhood kids hang out at her house, and her kids are sharing their faith with the neighborhood kids. Normally kids who go to public school are pulled down in their character, but not these kids. Her kids have a strong faith because she teaches her kids the Word of God. In my mind, she homeschools her kids all the time when they are not at school. Homeschooling is really investing your life into your children instead of into a TV set or a hobby. God can use any schooling situation for His glory. Back when I had no money at all, I would pray for the curriculum I needed, and God would provide it through used curriculum sales, yard sales, and resale shops. Or God would provide extra money out of the blue to help me purchase consumables. You can do a lot of homeschooling for free by getting books out of the library and using materials at home for experiments. A lot of great ideas are also found on the internet, including printables for all subjects. I have collected those links over time, and I have categorized them all inside my Unit Study Treasure Vault. What about sacrifices of time, flexibility, and mom’s me-time? You can trade off with a friend for baby-sitting, so that you can have some quiet time to yourself to re-charge and plan. You also need to rest. If you teach your kids to play independently at a young age, you can build time into your day where you can refresh yourself by taking a nap, reading, or blogging. Don’t hover over your children 24/7 or you will wear yourself out and have nothing left for your husband. Are the benefits worth the cost? How? Knowing your kids and having a real relationship with them is worth it. Your kids will know what you want them to know, because you will prioritize what is important to you. The relationships with my children make it all worth it. Is there anything else a mom has to give up when she homeschools? Most people paint a rosy picture of homeschooling. What are the honest cons? Friendships for your children are hard to get, and you have to be pro-active to get good friendships for them. We invite families over for dinner and enjoy families from my church or other homeschooling families. If you have a child who is lonely, you can actively seek out a friendship for that child and become friends with the mother of that child. Fatigue for the mom is another issue. Because your kids are with you 24/7, you can easily burn out. You need to take breaks. Enjoy your husband and go on dates with him. Nurture your marriage. Cultivate female friendships, too, where you go out to coffee just to enjoy being with friends. Does doubting your choice to homeschool mean you shouldn’t have done it? Once a year when my kids go to Vacation Bible School every morning for a week, I go home to a blissfully quiet house where I feel like I’m on vacation. I think to myself, “Wow, this is nice.” But that doesn’t mean I wouldn’t take homeschooling, with all the ups and downs that it brings, over any other form of schooling. I’ve been a teacher in public and private schools, and I can tell you that homeschooling for me is by far the best choice, and it’s totally worth it! This entry was posted on Wednesday, April 9th, 2014 at 8:00 am	and is filed under Homeschooling. You can follow any responses to this entry through the RSS 2.0 feed. You can skip to the end and leave a response. Pinging is currently not allowed. I’ve thought about homeschooling and I’m still on the fence. My patience is very little and I know my weaknesses. My boys are in public school right now and are thriving. I am in constant communication with their teachers and involved in their learning. I like that you said if “If God is leading you not to homeschool, you need to obey God.” I think because I am on the fence on it and I feel my boys are doing well, I need to obey God on this. He will change my heart if the need arises in the future. The biggest thing is for parents to be involved in their children’s education. It sounds like you’re really involved. My husband is the one to stay home and homeschool our two children. That was a decision we felt God press upon both of us. It was a process we prayed about for about two years before God presented an opportunity to make it happen. How wonderful to have a father full-time, teaching his kids!